If you've been searching for a the best lower ab exercise, look no further. These are the best lower abdominal exercises for the person who has decent core strength and flexibility. They are also for the person who has been exercising regularly for more than 1 month. If you are a beginner, I recommend mastering reverse crunches first, before attempting decline reverse crunches, and I recommend mastering leg raises before attempting decline leg raises. Starting Position: Lie on a declined board with your feet towards the floor and your arms overhead to stabilize your body. Form: Keeping your upper body still and your knees bent, curl your lower body up, bringing your knees towards your chest. Hold for 1 second and slowly lower to the starting position keeping your knees bent throughout the movement. Personal Trainer Tips: As you lift your knees towards your chest, attempt to lift your hips and pelvis off the boardthis is a key to making this exercise the most effective. If you have difficulty lifting your hips off the board, simply bring your knees as high as they will go until your strength and flexibility improves. 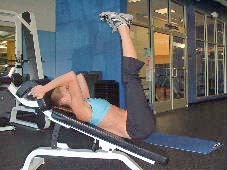 As you increase the angle on the incline, you make the exercise more challenging for the abdominal muscles. This exercise is an advanced lower ab exercise. It works your abs really hard, but it also places a lot of stress on the lower back. If you are just beginning, I recommend that you master other ab exercises before attempting this one. Form: Keeping your legs straight (knees very slightly bent), lift your feet towards your head. Hold for 1 second and slowly lower your legs to about 45 degrees. Hold for 1 second and then lift towards the head. Personal Trainer Tips: This exercise is different from the reverse crunches because your legs remain straight throughout the entire movement. You must pay really close attention to the position of your back as you lower your legs. If you feel your back arching, do not lower your legs as far. Use your ab muscles as you lower to keep your back flat against the board. The decline reverse crunch or the decline leg raise could be the best lower ab exercise for you. If you have decent core strength, good flexibility, and are in decent overall fitness this is a good abdominal exercise for you. 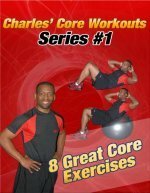 If you have poor core strength, poor flexibility, lower back pain, or have poor overall fitness, I recommend that you use other core exercises in your routine. I only recommend these exercises to people who have good flexibility and strength. Many of my personal clients have never tried these exercises because they can place a lot of stress on the low back. These exercises are advanced, so only use them when you have built a strong foundation and have mastered the basics. If you feel discomfort in your lower back, check your form and make sure that your back does not arch as you lower your legs. If you still have discomfort, seek the guidance of a professional.